1 D None No Power Seat 1 D is a standard Business Class seat located at a bulkhead that transforms into a fully flat bed. The close proximity to the galley and lavatory area might be bothersome. 1 E None No Power Seat 1 E is a standard Business Class seat located at a bulkhead that transforms into a fully flat bed. The close proximity to the galley and lavatory area might be bothersome. 1 K None No Power Seat 1 K is a standard Business Class seat located at a bulkhead that transforms into a fully flat bed. The close proximity to the galley and lavatory area might be bothersome. 1 L None No Power Seat 1 L is a standard Business Class seat located at a bulkhead that transforms into a fully flat bed. The close proximity to the galley and lavatory area might be bothersome. 10 B None No Power Seat 10 B is a standard Business Class seat that transforms into a fully flat bed. 10 E None No Power Seat 10 E is a standard Business Class seat that transforms into a fully flat bed. 10 L None No Power Seat 10 L is a standard Business Class seat that transforms into a fully flat bed. 11 B None No Power Seat 11 B is a standard Business Class seat that transforms into a fully flat bed. 11 E None No Power Seat 11 E is a standard Business Class seat that transforms into a fully flat bed. 11 L None No Power Seat 11 L is a standard Business Class seat that transforms into a fully flat bed. 16 A None No Power Seat 16 A may have even more extra legroom than standard Economy Plus seats due to the position of the Bulkhead. The tray table is in the armrest, making the armrest immovable and slightly reducing seat width. There is no floor storage for this seat during take-off and landing. 16 B None No Power Seat 16 B may have even more extra legroom than standard Economy Plus seats due to the position of the Bulkhead. The tray table is in the armrest, making the armrest immovable and slightly reducing seat width. There is no floor storage for this seat during take-off and landing. 16 C None No Power Seat 16 C may have even more extra legroom than standard Economy Plus seats due to the position of the Bulkhead. The tray table is in the armrest, making the armrest immovable and slightly reducing seat width. There is no floor storage for this seat during take-off and landing. 16 D None No Power Seat 16 D may have even more extra legroom than standard Economy Plus seats due to the position of the Bulkhead. The tray table is in the armrest, making the armrest immovable and slightly reducing seat width. There is no floor storage for this seat during take-off and landing. 16 E None No Power Seat 16 E may have even more extra legroom than standard Economy Plus seats due to the position of the Bulkhead. The tray table is in the armrest, making the armrest immovable and slightly reducing seat width. There is no floor storage for this seat during take-off and landing. 16 F None No Power Seat 16 F may have even more extra legroom than standard Economy Plus seats due to the position of the Bulkhead. The tray table is in the armrest, making the armrest immovable and slightly reducing seat width. There is no floor storage for this seat during take-off and landing. 16 J None No Power Seat 16 J may have even more extra legroom than standard Economy Plus seats due to the position of the Bulkhead. The tray table is in the armrest, making the armrest immovable and slightly reducing seat width. There is no floor storage for this seat during take-off and landing. 16 K None No Power Seat 16 K may have even more extra legroom than standard Economy Plus seats due to the position of the Bulkhead. The tray table is in the armrest, making the armrest immovable and slightly reducing seat width. There is no floor storage for this seat during take-off and landing. 16 L None No Power Seat 16 L may have even more extra legroom than standard Economy Plus seats due to the position of the Bulkhead. The tray table is in the armrest, making the armrest immovable and slightly reducing seat width. There is no floor storage for this seat during take-off and landing. 17 A None No Power Seat 17 A is a standard Economy Plus seat. 17 B None No Power Seat 17 B is a standard Economy Plus seat. 17 C None No Power Seat 17 C is a standard Economy Plus seat. 17 D None No Power Seat 17 D is a standard Economy Plus seat. 17 E None No Power Seat 17 E is a standard Economy Plus seat. 17 F None No Power Seat 17 F is a standard Economy Plus seat. 17 J None No Power Seat 17 J is a standard Economy Plus seat. 17 K None No Power Seat 17 K is a standard Economy Plus seat. 17 L None No Power Seat 17 L is a standard Economy Plus seat. 18 A None No Power Seat 18 A is a standard Economy Plus seat. 18 B None No Power Seat 18 B is a standard Economy Plus seat. 18 C None No Power Seat 18 C is a standard Economy Plus seat. 18 D None No Power Seat 18 D is a standard Economy Plus seat. 18 E None No Power Seat 18 E is a standard Economy Plus seat. 18 F None No Power Seat 18 F is a standard Economy Plus seat, however, this seat has limited underseat leg and storage room due to the presence of an entertainment equipment box. 18 J None No Power Seat 18 J is a standard Economy Plus seat. 18 K None No Power Seat 18 K is a standard Economy Plus seat. 18 L None No Power Seat 18 L is a standard Economy Plus seat. 19 A None No Power Seat 19 A is an Economy Plus seat with a misaligned window. 19 B None No Power Seat 19 B is a standard Economy Plus seat. 19 C None No Power Seat 19 C is a standard Economy Plus seat. 19 D None No Power Seat 19 D is a standard Economy Plus seat. 19 E None No Power Seat 19 E is a standard Economy Plus seat. 19 F None No Power Seat 19 F is a standard Economy Plus seat. 19 J None No Power Seat 19 J is a standard Economy Plus seat. 19 K None No Power Seat 19 K is a standard Economy Plus seat. 19 L None No Power Seat 19 L is an Economy Plus seat with a misaligned window. 2 A None No Power Seat 2 A is a standard Business Class seat located at a bulkhead that transforms into a fully flat bed. The close proximity to the galley and lavatory area might be bothersome. 2 B None No Power Seat 2 B is a standard Business Class seat located at a bulkhead that transforms into a fully flat bed. The close proximity to the galley and lavatory area might be bothersome. 2 L None No Power Seat 2 L is a standard Business Class seat that transforms into a fully flat bed. 20 A None No Power Seat 20 A is a standard Economy Plus seat. 20 B None No Power Seat 20 B is a standard Economy Plus seat. 20 C None No Power Seat 20 C is a standard Economy Plus seat. 20 F None No Power Seat 20 F is a standard Economy Plus seat. 20 J None No Power Seat 20 J is a standard Economy Plus seat. 20 K None No Power Seat 20 K is a standard Economy Plus seat. 20 L None No Power Seat 20 L is a standard Economy Plus seat. 21 A None No Power Seat 21 A is an Economy Plus seat that is missing a window. 21 E None No Power Seat 21 E is a standard Economy Plus seat, however, this seat has limited underseat leg and storage room due to the presence of an entertainment equipment box. 21 F None No Power Seat 21 F is a standard Economy Plus seat, however, this seat has limited underseat leg and storage room due to the presence of an entertainment equipment box. 21 L None No Power Seat 21 L is an Economy Plus seat that is missing a window. 22 L None No Power Seat 22 L is a standard Economy Plus seat. 25 D None No Power Seat 25 D is a standard Economy Class seat. However, the proximity to the lavatory may be bothersome. 25 E None No Power Seat 25 E is a standard Economy Class seat. However, the proximity to the lavatory may be bothersome. 25 F None No Power Seat 25 F is a standard Economy Class seat. However, the proximity to the lavatory may be bothersome. 26 A None No Power Seat 26 A is in the last row of the section and may have limited recline. The close proximity to the lavatories may be bothersome. 26 B None No Power Seat 26 B is in the last row of the section and may have limited recline. The close proximity to the lavatories may be bothersome. 26 C None No Power Seat 26 C is in the last row of the section and may have limited recline. The close proximity to the lavatories may be bothersome. Other flyers tend to bump into this seat. 26 J None No Power Seat 26 J is in the last row of the section and may have limited recline. The close proximity to the lavatories may be bothersome. Other flyers tend to bump into this seat. 26 K None No Power Seat 26 K is in the last row of the section and may have limited recline. The close proximity to the lavatories may be bothersome. 26 L None No Power Seat 26 L is in the last row of the section and may have limited recline. The close proximity to the lavatories may be bothersome. 3 L None No Power Seat 3 L is a standard Business Class seat that transforms into a fully flat bed. 31 D None No Power Seat 31 D may have restricted legroom due to the position of the Bulkhead. The close proximity to the lavatories may be bothersome. The tray table is in the armrest, making the armrest immovable and slightly reducing seat width. There is no floor storage for this seat during take-off and landing. 31 E None No Power Seat 31 E may have restricted legroom due to the position of the Bulkhead. The close proximity to the lavatories may be bothersome. The tray table is in the armrest, making the armrest immovable and slightly reducing seat width. There is no floor storage for this seat during take-off and landing. 31 F None No Power Seat 31 F may have restricted legroom due to the position of the Bulkhead. The close proximity to the lavatories may be bothersome. The tray table is in the armrest, making the armrest immovable and slightly reducing seat width. There is no floor storage for this seat during take-off and landing. 32 A None No Power Seat 32 A has extra legroom due to the Exit Row in front, however the close proximity to the lavatories may be bothersome. The tray table is in the armrest, making the armrest immovable and slightly reducing seat width. There is no floor storage for this seat during take-off and landing. This seat has a misaligned window. 32 B None No Power Seat 32 B has extra legroom due to the Exit Row in front, however the close proximity to the lavatories may be bothersome. The tray table is in the armrest, making the armrest immovable and slightly reducing seat width. There is no floor storage for this seat during take-off and landing. 32 C None No Power Seat 32 C has extra legroom due to the Exit Row in front, however the close proximity to the lavatories may be bothersome as other flyers tend to bump into this seat. The tray table is in the armrest, making the armrest immovable and slightly reducing seat width. There is no floor storage for this seat during take-off and landing. 32 J None No Power Seat 32 J has extra legroom due to the Exit Row in front, however the close proximity to the lavatories may be bothersome as other flyers tend to bump into this seat. The tray table is in the armrest, making the armrest immovable and slightly reducing seat width. There is no floor storage for this seat during take-off and landing. 32 K None No Power Seat 32 K has extra legroom due to the Exit Row in front, however the close proximity to the lavatories may be bothersome. The tray table is in the armrest, making the armrest immovable and slightly reducing seat width. There is no floor storage for this seat during take-off and landing. 32 L None No Power Seat 32 L has extra legroom due to the Exit Row in front, however the close proximity to the lavatories may be bothersome. The tray table is in the armrest, making the armrest immovable and slightly reducing seat width. There is no floor storage for this seat during take-off and landing. This seat has a misaligned window. 37 D None No Power Seat 37 D may have limited legroom and storage space underneath the seat due to the presence of an entertainment equipment box under the seat in front. 37 E None No Power Seat 37 E may have limited legroom and storage space underneath the seat due to the presence of an entertainment equipment box under the seat in front. 37 F None No Power Seat 37 F may have limited legroom and storage space underneath the seat due to the presence of an entertainment equipment box under the seat in front. 4 L None No Power Seat 4 L is a standard Business Class seat that transforms into a fully flat bed. 41 A None No Power Seat 41 A has extra legroom due to the curvature of the plane. 41 L None No Power Seat 41 L has extra legroom due to the curvature of the plane. There is a video entertainment box underneath the seat in front but this does not limit the legroom since this seat has a higher pitch. 42 A None No Power Seat 42 A has reduced seat width due to the curvature at the tail of the plane, and passengers may feel cramped. 42 B None No Power Seat 42 B has reduced seat width due to the curvature at the tail of the plane, and passengers may feel cramped. 42 C None No Power Seat 42 C has reduced seat width due to the curvature at the tail of the plane, and passengers may feel cramped. 42 J None No Power Seat 42 J has reduced seat width due to the curvature at the tail of the plane, and passengers may feel cramped. 42 K None No Power Seat 42 K has reduced seat width due to the curvature at the tail of the plane, and passengers may feel cramped. 42 L None No Power Seat 42 L has reduced seat width due to the curvature at the tail of the plane, and passengers may feel cramped. 43 C None No Power Seat 43 C may get bumped by service carts or others passing by due to the transition from 3 seats to 2 seats in the row behind. 43 F None No Power Seat 43 F is a standard Economy Class seat however, this seat has limited underseat leg and storage room due to the presence of an entertainment equipment box. 43 J None No Power Seat 43 J may get bumped by service carts or others passing by due to the transition from 3 seats to 2 seats in the row behind. 44 A None No Power Seat 44 A is in the last row of the plane and may have limited recline. The close proximity to the lavatories and galleys may be bothersome. 44 B None No Power Seat 44 B is in the last row of the plane and may have limited recline. The close proximity to the lavatories and galleys may be bothersome. 44 D None No Power Seat 44 D is a standard Economy Class seat however the close proximity to the lavatories may be bothersome. 44 F None No Power Seat 44 F is a standard Economy Class seat however the close proximity to the lavatories may be bothersome. 44 K None No Power Seat 44 K is in the last row of the plane and may have limited recline. The close proximity to the lavatories and galleys may be bothersome. 44 L None No Power Seat 44 L is in the last row of the plane and may have limited recline. The close proximity to the lavatories and galleys may be bothersome. 45 D None No Power Seat 45 D is in the last row of the plane and may have limited recline. The close proximity to the lavatories and galleys may be bothersome. 45 E None No Power Seat 45 E is in the last row of the plane and may have limited recline. The close proximity to the lavatories and galleys may be bothersome. 45 F None No Power Seat 45 F is in the last row of the plane and may have limited recline. The close proximity to the lavatories and galleys may be bothersome. 5 A None No Power Seat 5 A is a standard Business Class seat that transforms into a fully flat bed. The close proximity to the galley and lavatory area might be bothersome. 5 B None No Power Seat 5 B is a standard Business Class seat that transforms into a fully flat bed. The close proximity to the galley and lavatory area might be bothersome. 5 D None No Power Seat 5 D is a standard Business Class seat that transforms into a fully flat bed. The close proximity to the galley and lavatory area might be bothersome. 5 E None No Power Seat 5 E is a standard Business Class seat that transforms into a fully flat bed. The close proximity to the galley and lavatory area might be bothersome. 8 A None No Power Seat 8 A is a standard Business Class seat at a bulkhead that transforms into a fully flat bed. The close proximity to the galley and lavatory area might be bothersome. 8 B None No Power Seat 8 B is a standard Business Class seat at a bulkhead that transforms into a fully flat bed. The close proximity to the galley and lavatory area might be bothersome. 8 D None No Power Seat 8 D is a standard Business Class seat at a bulkhead that transforms into a fully flat bed. The close proximity to the galley and lavatory area might be bothersome. 8 E None No Power Seat 8 E is a standard Business Class seat at a bulkhead that transforms into a fully flat bed. The close proximity to the galley and lavatory area might be bothersome. 8 K None No Power Seat 8 K is a standard Business Class seat at a bulkhead that transforms into a fully flat bed. The close proximity to the galley and lavatory area might be bothersome. 8 L None No Power Seat 8 L is a standard Business Class seat at a bulkhead that transforms into a fully flat bed. The close proximity to the galley and lavatory area might be bothersome. 9 B None No Power Seat 9 B is a standard Business Class seat that transforms into a fully flat bed. 9 E None No Power Seat 9 E is a standard Business Class seat that transforms into a fully flat bed. 9 L None No Power Seat 9 L is a standard Business Class seat that transforms into a fully flat bed. An AC power port is located at each seat in Polaris. There are two outlets for each set of triple seats and one outlet for each set of double seats in Economy. The seat map of this United Airlines 777-200 is configured with Polaris business, Economy Plus, and Economy seating. The aircraft is used on long-haul intercontinental routes. Selected this sea because of the comments here. Great choice. Felt like premium economy space. There is a metal box on the ground, so if you’re tall like me (193cm) you will hit it with your feet. But there is some space left and right of it. Slept the whole flight. It is bulkhead seat, great leg room. This Seat does not recline. But I noticed that other seats in the Bulkhead do recline. On my return trip from Israel on the same equipment type, i will take not of all the seats in row 16 and report back which one recline and which one do not recline. Great informative web sit. Good job. I love the back two seats on this plane! I don't agree that they should be considered "bad seats" and here's why: if you're flying solo and choose the aisle, it's pretty unlikely that another person will reserve the window (unless the flight is sold out) and then you have a little nook all to yourself. Because there are only 2 seats on this row, the aisle seat has lots of shoulder room, and you can cross your legs without getting bumped by the trolley or passengers on their way to the toilets. I don't find the toilet traffic bothersome here - and there's plenty of room to stand up and stretch your legs. I get the option of upgrading for free to Economy Plus seats, and yet I still always choose 44B or 44K. The recline is great, no one is behind you bumping your seat - it feels a bit more private and cozy back here. I had economy plus seat 22A on a direct flight from Amsterdam to Houston on 9/29/18. I found the area spacious with tons of leg room. My bag fit perfectly under the seat in front of me and i was able to use it as a foot stool easily. I was pleasantly surprised with the recline of this seat as when you pressed the recline button your seat back went back and the seat moved forward like a real recliner! I was able to sleep with no problem. There was no real view from the window as the seat is located over the wing. The inflight entertainment was very nice as well. I would not hesitate to reserve this seat again. Overall comfortable seat. My main compliant was the flight attendants stomping up and down the aisle for the entire flight IAH-LHR. 8.5 hrs of this. Some stomped so hard they shook the seat. I always choose these center seats when travelling solo so I always have direct aisle access. I only choose the window seat pairs when I have a companion. The Seat was incredibly worn and flight attendants were rude. United stranded me in China for 2 1/2 days. Footwells are really small and uncomfortable to sleep in, even for me at 5' 6''. From a United Premier, Please try to avoid United by all means possible! This is a window seat in Business Class, but there is another seat between my seat and the aisle. So on this nearly 15-hour flight, I had to bother/wake up the stranger seated next to me, or climb over her. This was not a comfortable arrangement, considering the price I paid for this Business Class seat. Polaris Business class seat configuration specially near the windows is atrocious. Person sitting in the window seat has to climb over the aisle seat. I also find that the space for feet is not adequate. I had to keep my legs crossed to accommodate both feet in the small space provided for the feet. I flew on another configuration and in that every seat had direct access without having to climb over the passenger in the aisle seat. However the space for feet was the same. I guess this seat is better than most, but I found the emergency slide cover that protrudes from the exit door to be a little annoying. It doesn't completely block legroom, but even the partial blockage can be an issue on a long EWR-HKG flight. There is a box for electrical connections or something under seat 19F in front, and it takes up some of the room for your feet. Also, there are electrical outlets near the floor *between* the seats, so only 2 outlets for 3 seats. Seats 18K and 18L have limited leg space due to what seems to be entertainment equipment. I booked my seat based off of previous comments claiming extra legroom for the windows (A&L) of row 41. This is most certainly true, the windows have more legroom than the middle seats, which have slightly more legroom than the aisle. This is due to the curvature of the plane, and the layout of the seats. Try your best to book these! First time I've ever been in a plane where the forward bathroom is adjacent to seats. Think of it like this: seats 1AB have been replaced by a bathroom. So sitting in 1DE guarantees noise, light and smells throughout the entire flight. 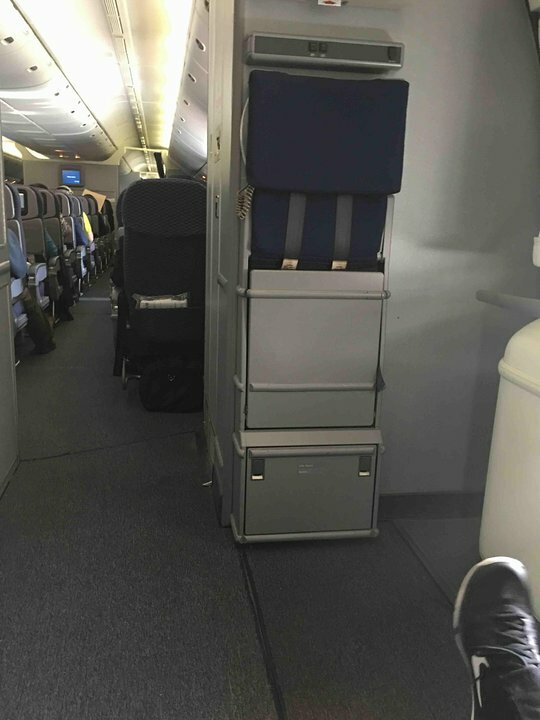 A metallic box under Seat 21F reduced the amount of carry-on space on the floor. I had to store my laptop bag in the overhead bin. A similar box was under Seat 21E. Should be yellow. Leg room is limited for your left leg because it's impaired by an equipment box beneath 38F. EWR-HKG, seat 16L. Great seat! Would sit there, again. Decent food; hot & was served, first. Terrible customer service. Boarded when the flight was about half full. There was no room in the overhead bins by my seat. Placed my bag about 3 rows back. When flight attendant came through, she moved my bag back further several rows. Dressed in a suit, I asked politely if I could place it in a business class bin across the aisle that was nearly empty. She said, no; safety issue. Really??? Granted, passengers were bringing oversized carry-ons and United only pulled a few grossly large ones. Discovered the tilt-up touch screen responds better to a pen (as a stylus) than touch. Otherwise, the flight was good, other than 2 hours late. This is an older plane that looks worn but still has 3-3-3 so it's worth the somewhat grainy and buggy entertainment system. Seat in front had an entertainment box but with all my stuff overhead and the extra legroom, it didn't matter. Food is very poor as usual with United but at least it's still only 9 across! Extra comment: flew 41A before and has nearly same leg room as the economy plus. Only one window available instead of 3 as the other Business class seats. Seat should be shown as yellow. Minimum "missaligned window", better would be "missing window". I had the light from the galley near the cockpit in my eyes sitting here. There is no overhead storage for this seat. OMG. This is a terrible seat. Seat Guru didn't tell me there was limited leg room due to the electronic box located beneath the seat in front of me. There is nowhere to put my feet. I am in purgatory on a flight from Houston to London. Not to mention the kids in back kicking my seat. Aaaaakkkk. Wonderful seat with a nice amenities kit, was able to only sleep 2 hours out of my 6 hour flight but that was none the fault of united. Both meal services were great and the crew was amazing. I found the lie-flat seat very comfortable, and the amenity kity, blankets and pillow provided were excellent. I was able to sleep a straight six hours and arrived at the end of my 16-hr flight without jet-lag. Because I had no down-time due to jet lag, the upgrade was worth it. Flew in this seat from EWR to BOM. No problems were encountered. Seat was good, service was good, food was good. When booking business class on 777-200s its important to pay attention the type of seating the aircraft offers. I flew this aircraft from IAH to AMS on legacy Continental 777 which has a 2-2-2 layout. Legacy United 777 are in 2-4-2. Which means that business class seats have a middle seat. On my flight, I had a window seat and I was also fortunate that no one was sitting next to me so I didn't have to climb over my neighbor. All of the new Polaris upgrades were great. The pillows and blankets were great. The meals were fine. It's still airplane food so don't expect 5 star dinning but a nice upgrade from previous 1st class dinning. The cabin was comfy and the flight attendants were helpful. Totally worth the miles to upgrade. Biggest take away, pay attention to the version of the 777 used when traveling international business class. 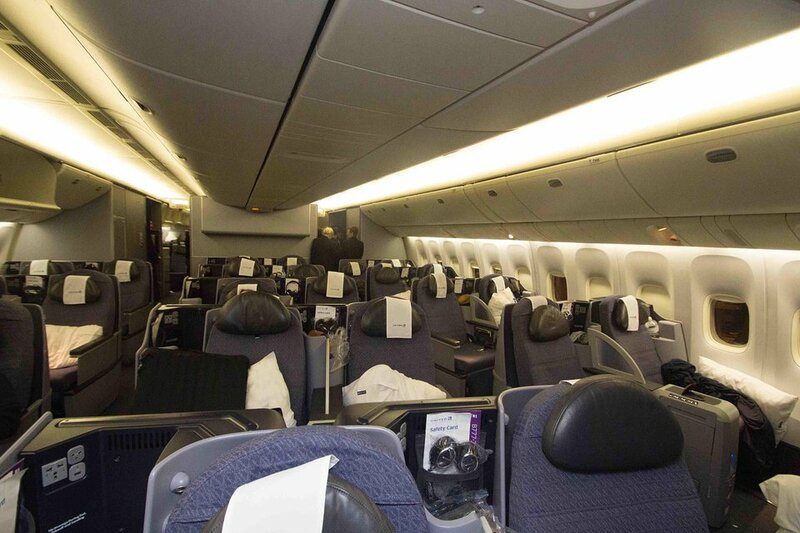 Try to fly on legacy Continentals until they retro-fit the fleet with the new Polaris seats and roll out the 777-300s. Seat has larger footwell. flight was from IAH to AMS. Flight was fantastic and service great. food was excellent as well. I am 6'2" 190 lb and had my knees to the front seat the whole 8 hr trip, pathetic, Never knew when you book a flight you have to actually check if the seat they assign provides any level of comfort! Travelled on this flight on 10/31/16, LHR to IAH, and returned on UA880, on 11/14/16, IAH to LHR. I had pre-booked this seat for both flights based upon two existing positive reviews regarding extra legroom because of the curvature of the aircraft. I'd like to thank the previous reviewers and affirm that this is, indeed, an excellent seat within economy, the legroom being as good as that for economy plus. Absolutely horrible seats. Leg room is not the issue but the shape of the seats. A steward and a stewardess on my flight confirmed that the complaints are legion and they themselves find the seats the historically most uncomfortable in any aircraft. I've also heard numerous complaints from friends. The seats must have been designed by Torquemada as a second choice to waterboarding. 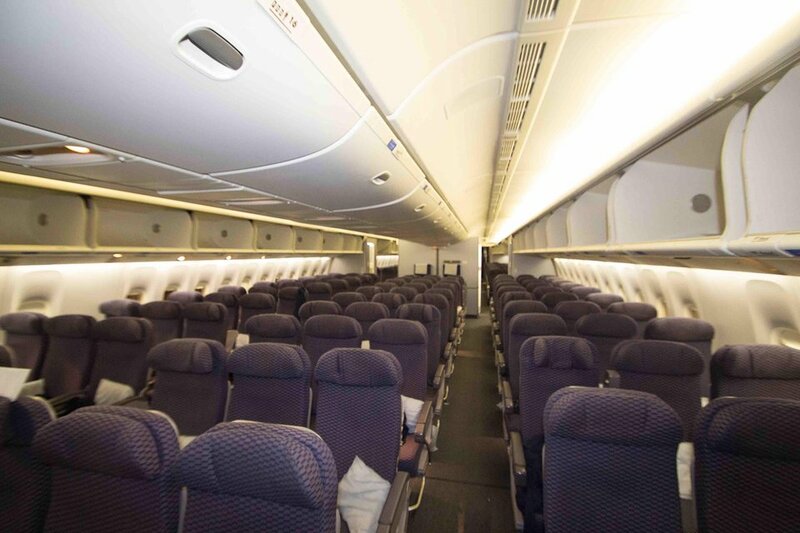 The same was true of the seats (32D) on a 737-900. The seats at 44A & 44B are excellent seats if looking for just two together. They have full recline and have extra space since the curviture of the rear of the plane provides extra shoulder room at 44A. The seat is about 10" away from the window. As fo 44B, there is no 44C and is just open space. I found these seats to be the best in economy. On draw back is the area is active at certain times for the lavatory. Highly recommed seats. Row 9 in this (ver 3) config are servicible semi-pod seating in 2-2-2 layout. Reasonably comfortable for 16 hour flght if a little aged in style. Bulk head seats on ver 3 (8A-8L) have MUCH greater footwell and floor storage than do rows 9-11 (see photo comparison). If this matters, pick row 8 over the others. The seats are in economy plus and while the extra leg room is nice, United almost always (I've been on this flight many times) upgrades economy passengers to Economy Plus at the very last minute. My wife likes windows, I like aisles. So we book them accordingly and usually wind up with some boorish passenger on top of both of us in the middle seat for ten hours. Do yourself a favor, make every effort to route yourself on a 767 which has 2-3-2 seating. Much much more comfortable. I would say about twice as much leg room than 41C. Flew from Newark to New Delhi (15 hour red eye). Their economy is comfortable and has a decent leg space. You don't feel cramped and it's okay if you don't get an economy plus. Always choose an aisle for long duration flights. But the close proximity to lavatories from this seat makes this a bit annoying as there's so many people around waiting in the queue. 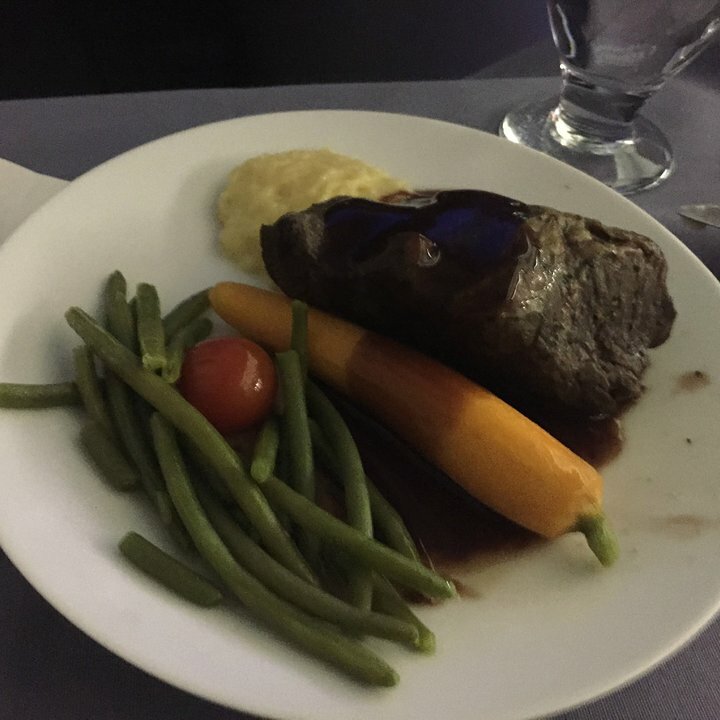 Food's below average for United on this route. But complementary beer and wine services make it worth. The seat is the standard BusinessFirat. The only thing I noticed is that the foot well is narrower than some of the others. If you are tall enough to reach there when in lay flat it would be tight for two feet. I only noticed in contrast with 8am which has a very wide foot well (fits the whole blanket. I thought this seat was great - comfy and extra leg room. You have to lean forward a bit to look out the window but the area next to your head is solid wall, which was great for resting against to sleep. NRT to IAH. Economy plus is must at 6'5" and leg room was fine. The seat itself, however, is hideously uncomfortable and generally dirty. FA were grumpy and food was inedible. Also, even if you eat the food bring own meals since only one two meals served on 13 hour flight. Lots of leg room because the row is pie shaped due to the curvature of the plane. Im 6 ft tall and there was lots of room for my legs. Seat 11A for 15 hours from EWR-HKG was great. The seats may not be the newest, but there is plenty of storage, the food selection was good, drinks were good and the United flight attendants were pleasing and friendly. The only negatives are having to step over the person in 11B (in my case my wife) to get up during the flight and the annoying seatbelt announcement mentioned in other comments. Seats in this whole row 17 have av boxes under the seat in front. Limits how far your feet can slide under the seat in front. More roomy than economy but definitly a limitation! Slightly more legroom here because the block of seats seem to curve outward. Even with the person in front of me putting her seat back all the way, there was plenty of room for my knees. And I'm 6"4! The two class Boeing 777's have a recorded announcement that comes on every time the fasten seatbelt sign is turned on. The announcement says, "Ladies and Gentlemen, the captain has turned on the fasten seatbelt sign. Please return to your seat and fasten your seatbelt." The announcement is very loud and I can't imagine anyone being able to sleep through it. United will turn the fasten seatbelt sign on many times during the flight--even if it is a smooth flight. On my 14 hour flight from Houston to Tokyo, the fasten seatbelt recording woke me up five hours from Tokyo, and I was never able to get back to sleep. Wide and comfortable but if the person in the window needs to get out they will step over you. Near galley and only 1 window from typical 2 or 3 of other seats. Passengers between Japan & US who alternate between United and ANA should be aware that ANA has now introduced 10-across seating in its regular economy class section. UA's service is not up to ANA's standard and ANA is usually flying newer planes, but the new 10-across seating on ANA is true bummer. Hope ANA will see the error of their ways soon. Maybe frequent flyers already know what's going on as my ANA flight from JFK at beginning of September was only 60 to 70% full. The foot well on this bulkhead seat is very roomy. Other rows have foot wells that are pie shaped and cramped. A big plus for trying to sleep comfortably. I travel with a thin blanket to place on the seat cover. It fits in my computer bag and adds a layer of protection from the fabric that was used by countless thousands of other travelers and is not what I consider clean enough for me to sleep. Flew UA1 IAH->NRT today. An old Continental plane (2 class 777-200). Seats in "BusinessFirst" are broader and better designed (in general) than United configured business first airplanes. 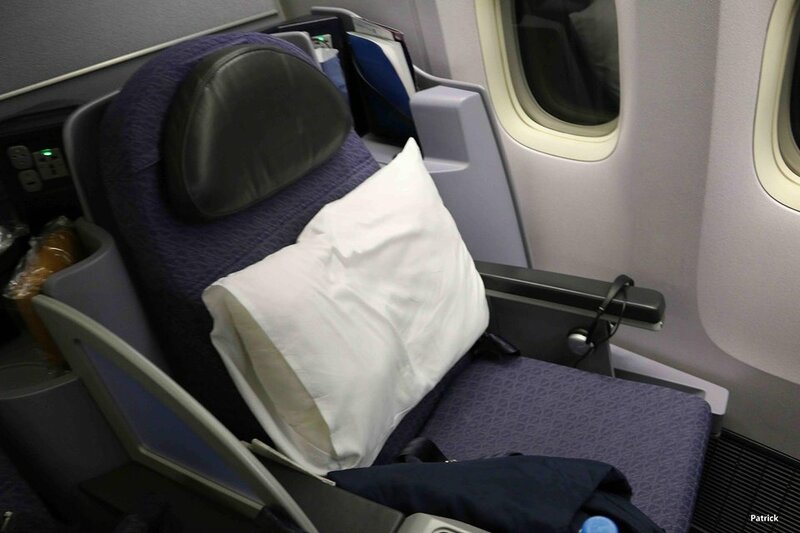 However, the storage space around the seats is very limited and the headrest design means that trying to sleep in the "lie flat" position is very uncomfortable. Lighting is poor and climbing over the aisle passenger is a chore. UA also doesn't offer music selections any more on this aircraft (although they advertise them as available). Finally, the seats were really filthy. Since UA doesn't provide a lower blanket, you have to sleep directly on the dirty seat covers and dust-covered plastic surrounds. American's new First class and Delta both offer a much better experience. *** Last Row of Economy Plus - BEWARE *** ... I am a fan of Economy Plus. Take it when I can get it. The biggest benefit is that you get more legroom. More leg room for me in front, and less people kicking the back of my seat. So think about it. If you are in the last row of Economy Plus, your chair will be kicked just anyone in any other seat in economy. I learned this the hard way. If all you have in Economy Plus is the last row, so be it. But if you have a choice, never get the last row of Economy Plus. My two cents. The cabin was very hot. It was a very uncomfortable ride, even if it was business class, because the seats are made of a thick, heavy fabric. It also claims to be flat bed but the foot of the bed tipped down ever so slightly so as to be very uncomfortable. It feels like you're falling off the seat. I do recommend to sit at seat no. 41L due to it has long legroom and 2 windows. The PTV operation was really good. Overhead compartment for carry-on luggage is large. The recline was not limited. I found it very convenient since you have a lot of space around. I was able to put my personal item underneath 43J with a very good access. That seats behaves as a aisle seat, so you can get up anytime you want, and there is only person bothering you (44L). If you are travelling alone in coach, this is a good option for this long trip. I find the seats in Business First to be quite comfortable. Bulkheads offer more deck space for your stuff. But stay way from 1d. I was pleasantly surprised with the amount of leg room in this Economy Plus seat; not as much as the bulkhead seats but I wasn't crowded, even with the person in front leaning their seat back the whole way. And you get the convenience of having a place to store things during the flight. Great coach seat as long as you don't have anything you need during the flight and you don't want to do any work with the table. Every time you pull out the table you have to bother the person in the middle seat. There is only a small storage sleeve on the bulkhead wall. That said, the leg room is awesome and the area is quiet since Business/First is directly in front. Economy plus on this version 777 is quite comfortable, even for a 10+ hr flight, as long as you're not expecting to sleep much. A big advantage of the extra legroom is easier in/out of the seat to the isle. IFE box takes up some leg room, but not much, and the 7" screen is passable. Kudos to UA to keeping the 777 at 9-across instead of jamming in 10 seats(yes, I mean you, Emirates). Always take this seat and flying at least 10 times a year cross pacific. The best seat by far. Depending on flights, bathroom may or may not be an issue. Overall it has great leg room but no floor storage for take off and landing. Row 16 is the first row in Economy Plus. Seat 16C is on the left aisle. The plus side is that you definitely have a lot of leg room. However, the wall in front of seats 16AB&C ends half way in front of seat 16C so you feel as if you're sitting out in the open (with traffic from business class coming straight at you until they close the curtain). Also, there is a monitor mounted up on the wall of Row 16 that continuously updates your flight progress. This monitor never turns off so you have a light in your eyes the entire flight, which made it difficult to sleep. I have sat in other seats in Row 16 and the light from this monitor was not a problem. For some reason, it was very bothersome in seat 16C. The Lav door opens right into the 1D "BusinessFirst" seat Noise, Constant Traffic, Bathroom Stinks- SMELLS, flushing toilet...the worst 16 hour flight I ever experienced...UA has nerve to offer this seat as a revenue seat let alone a Business class seat...it should be removed....In a word, Disgusting!!!! I want my money back! There is more leg room in row 16 but this entire row A through L is usually filled with families with children/babies. Often it is the noisiest section on the aircraft. An adult sitting without children may be asked to change seats to accommodate families who didn't get the seats they wanted at check in. United flies 3 versions of .